Project duration: November 2013 - November 2015. Project donor: BP EXPLORATION (Caspian Sea) Ltd. Georgia. The project aims at contributing to the national energy security and global environment through offering tools and means for improvement of energy efficiency in Georgian communities and reduction of emissions of GHGs in response to the challenge of the climate change. Increase public awareness on available energy saving technologies and measures, as means of saving money, as well as reducing fuel use, thus contributing to the reduction of emissions and environmental protection. Target municipalities - Covenant of Mayors signatories - Tbilisi, Rustavi, Gori, Batumi, Telavi, Kutaisi, Zugdidi & Akhaltskhe. Sectors considered for identification of potential demo projects-buildings (public buildings & facilities (government owned community facilties: schools, kindergartens, medical centers, art & sport schools, orphanages, etc., and/or collectively owned residential multistory apartment buildings), infrastructure, including lighting as sectors with high potential of achieving the energy saving. Envisaged measures are in line with adopted SEAPs under CoMsorSocio-Economic Development Plans (SEDP)- (High Current energy consumption with possibility for energy savings against baseline and emission reductions resulting from introduction of energy efficient measures or renewable energy technologies). The project envisaged the replacement of 120 sodium street light lamps around the lake in Rustavi Central Park with LED lighting systems. The project implementation started in September 2014 and was completed in November 2014. To monitor project results EEC installed 4 meters to record actual expenditures of the electricity by the LED lamps. 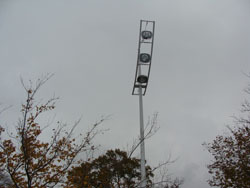 The project information light box was installed in the park. The implemented project will help Rustavi, to fulfill its obligations to reduce CO2 emissions by 20% by 2020 undertaken under the Covenant of Majors. The official project launch and media tour to the project site took place on March 12,2015 within the Sustainable Energy Day organized together with Rustavi municipality. The Sustainable Energy Day events were attended by the representatives of BP Georgia, Rustavi city administration officials, Kvemo Kartli region governor and representatives of the municipalities, representatives of national and local media, EEC Georgia project team. The events started with presentation of the implemented demo project in Rustavi park which was followed by the thematic poster presentation “Rustavi – Energy Efficiency – Me” made by the eco-club students from 7 Rustavi Public schools. 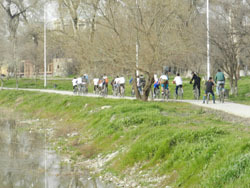 Rustavi amateur bikers cycled around the lake with motto “Healthy Lifestyle – Less Emissions”. By the end of the organized events the participants of the presentations “Rustavi- Energy Efficiency –Me” were awarded with certificates for participation in sustainable energy day event and T-shirts. The project envisaged the construction of the solar thermal system with the solar collector area of 72 sq.m and water tank capacity of 2250 litres at Gori Military Hospital. Implemented energy efficient measure will enable the Hospital to reduce up to 70 % electricity and natural gas consumption for heating water for its several buildings (infectious disease ward, laundry and kitchen), decrease energy bill and reduce CO2- emissions into atmosphere. The project implementation started in 2014 and was completed in January 2015. The official project launch and media tour has been scheduled for June 4, 2015. 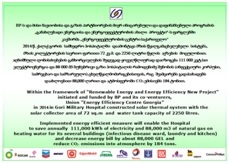 The project launch event will be included in the Georgian Sustainable Energy Week 2015 agenda. 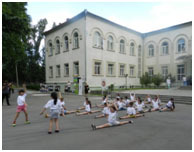 The project launch events started with Flash mob” performed by the young athletes from Gori gymnastic school which was followed by the presentation of the implemented demonstration project. The gathered audience including hospital administration and employees, representatives of various media, children and parents were greeted by Mr. Chris Schluter, General Manager of BP in Georgia, Mr. Davit Ebralidze - 1st Deputy Minister of Defense, representatives of the city and hospital administrations. 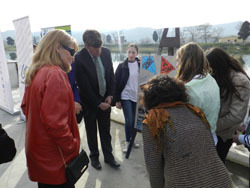 Invited guests toured the hospital yard to view the constructed solar thermal system and „Street art” thematic drawings on asphalt presented by Gori art school students. The project envisaged the replacement of 74 high pressure sodium street light lamps in Telavi, Kavkasioni St. and adjacent territory which includes back roads to the apartment buildings, stadium and kids playground with LED lighting system. The physical installation works were completed at the end of November 2014. 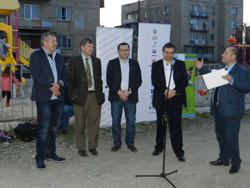 The official project launch and media tour was organized on April 17,2015 in partnership of Telavi City Hall within the framework of Sustainable Energy Day in Telavi. The project information light box was installed next to the children’s playground. It is estimated that the implementation of the project will result in annual reduction of electricity consumption by about 48600 kWh, decrease of expenditures for consumed electricity by about 6700 GEL and annual reduction of CO2 emissions by 3600 kg. The event in Kavkasioni St . was opened by children’s dance ensemble who performed street dances next to the playground in Kavkasioni St. Gathered population and the invited media to the launch event were greeted by the City Mayor, Head of City Council, BP in Georgia General Manager. Telavi public School #1 is located in the city center in historic building dated back to the 18-th century. The school was established in 1758 by the king Erekle II as “Philosophy School”. Replacement of 180 incandescent light bulbs with CFLs in the classrooms and replacement of 40 double tube fluorescent lighting systems with 76 LEDs in the corridors. It is estimated that the implementation of the above measures will result in annual decrease of expenditures for consumed energy resources by about 9000 GEL and annual reduction of CO2 emissions by 6300 kg. The project envisages the introduction of such energy efficient measures as replacement of old single glazed wooden frame windows with double glazed PVC ones and introduction of modern heating and cooling system. The project is co-financed by: Batumi City hall, which took the responsibility to replace the old windows with double glazed PVC ones. The sub-contract agreement with “Geowatt” Ltd. for the modernization of the heating and cooling system in City Hall Building was signed on December 25, 2014. According to the agreement the start of site works were planned in March 2015 with completion of the construction works by the beginning of April 2015. The sub-contract agreement between EEC Georgia, Batumi City Hall and Geowatt Ltd was signed on April 7, 2015. By the end of May 2015 the sub-contractor finalized all the construction works with the exception of the connection to the electric service panel. As the existing panel didn’t meet some technical specifications to ensure safe connection Batumi City Hall announced tender for supply and installation of the required electric service panel. As the tender for the supply of electric panel was postponed several times the EEC sub-contractor replaced the existing panel with the required one. As the all the works stipulated by the contract were fulfilled and all the equipment was installed, EEC started to make all the necessary arrangements for the system test and commissioning. During the testing period some mistakes made by the sub-contractor during the system design and specification of the system capacity was revealed, i.e. the system couldn’t provide necessary temperature for cooling to ensure comfort for city hall employees and visitors. After intensive consultations and discussions with the sub-contractor on the system efficiency and capacity needed for cooling to ensure comfort level in the building, it was decided to combine new and old cooling system till the technical solution of the problem are proposed by the sub-contractor. In September-October 2015 in addition to earlier installed equipment overhead and floor type fan coil units were installed. This decision allowed for 100% satisfaction of needs for heating in the building. As for the cooling, with the consideration of characteristics of the installed heat pumps, it would be possible to produce amount of cold to satisfy by 60% the needs of the building for cooling in summer. To ensure security and reliability of heating/cooling in the building as a back up the existing heating and cooling systems were preserved. For example in the case of power failure for a long period of time the heating could be arranged with the utilization of existing diesel boiler. 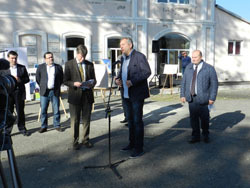 On November 19,2015 the official letter of acceptance was signed by all the parties involved- Batumi City Hall, Energy Efficiency Center Georgia & “Geowatt” Ltd. On December 12,2015 EEC Georgia representatives together with the sub-contractor visited the city hall and conducted informational meeting on the installed equipment and disseminated the brochure developed by the EEC Georgia describing various types of heat pumps , their operation and benefits. In the building hall the Display poster illustrating building energy performance for the year was also fixed. To compare building performance after the implementation of the energy efficiency measures by the end of 2016 new poster will be developed and installed. Official project launch event will take place in early 2016. The date will be specified based on the consultations with the project donor and Batumi City Hall officials. 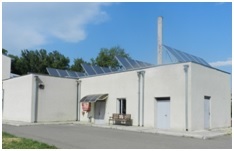 The project envisages the implementation of such energy efficient measures as: introduction of autonomous heating and hot water supply system on natural gas, construction of solar thermal system integrated with heating and hot water supply system, EE upgrade of the building envelope, including insulation of external walls, construction of enclosure walls and doors to separate building cold spaces from warmer occupied areas, and replacement of incandescent light bulbs with CFLs. The project is co-financed by: Tbilisi City hall, State Fund for Protection and Assistance of (Statutory) Victims of Human Trafficking, USAID/Winrock within EC-LEDS grant program. The project envisages the implementation of such energy efficient measures as: introduction of autonomous heating and hot water supply system on natural gas, construction of solar thermal system integrated with heating and hot water supply system, EE upgrade of the building envelope, including insulation of external walls, construction of enclosure walls and doors to separate building cold spaces from warmer occupied areas, and replacement of incandescent light bulbs with CFLs. As during the project development phase it was obvious that BP allocated funds for the implementation of demonstration project would not be enough to implement complex of energy efficient measures resulting in energy savings, emission reductions as well as social impact of the project EEC sought financial support from Tbilisi City hall, State Fund for Protection and Assistance of (Statutory) Victims of Human Trafficking, USAID/Winrock within EC-LEDS grant program. Tbilisi City Hall as a Covenant of Mayors signatory expressed its readiness to support the project and allocated 26,216.90 GEL for the construction of the boiler house. State Fund for Protection and Assistance of (Statutory) Victims of Human Trafficking in support of the project performed the works on insulation of external walls (about 160 m2), construction of enclosure walls and doors to separate building cold spaces from warmer occupied areas (50 m2, weatherization of external windows and doors (65m2), provided some used upgraded spare parts for the central heating system and financed the works for the connection of the system to the gas main worth 60, 060.96 GEL. After intensive communication with Winrock and provision clarifications on various aspects of the project on April 27, 2015, EEC Georgia received notification on grant award and started consultations on contract details. With above in mind and considering that one of the potential sub-contractor (Tbili Sakhli Ltd.) had issued earlier commitment letter to perform the works on supply and construction of heating and hot water system till end of April, 2015 at a cost provided in the end of January and won’t consider currency fluctuation rate, EEC started implementation of this part of the project. Tbili Sakhli Ltd. finished all the works associated with piping and installation of radiators in the buildings. The works were finalized upon the boiler house construction and connection to the gas main. All the site works were supervised by the supervisor G.Berozashvili who prepared daily and weekly reports on the work in progress. By the mid September 2015 all the site works on the construction of the heating system have been completed and the system was tested upon the gas distribution company started the gas supply to the facility. With the start of heating season the system started operation at full capacity. As for the part of the project related to the supply/ construction of solar thermal system and replacement of regular bulbs with energy saving ones, grant award contract with USAID/Winrock was signed on September 22,2015 with the duration of 9 months ending on June 30,2016. 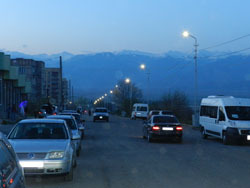 This project is exceptional as the site currently physically is not located on the territory in CoM municipality, though proceeding with big interest on the part of the Rugby Union of Georgia to the project and with the consideration of rugby national team success, it was decided to implement demonstration project at the Rugby Sports Base in Martkopi. The project envisages the installation of solar thermal collectors with total area of 34,5 sq.m. installed on the common roof of the bathhouse and tribune which will provide the facility with 2000-2500 litres of hot water daily. The project envisages the implementation of energy saving measures such as introduction of solar thermal water heating system integrated with existing system for heating and hot water supply operated on natural gas, solar lighting system along the footpaths between the buildings, EE upgrade of the existing hot water and heating supply system, building envelope and replacement of incandescent light bulbs with energy saving ones. It is estimated that the introduction of above energy efficient/saving solutions will reduce not only electricity and gas consumption and energy bills by at least 15% and result in significant CO2 reductions but also will contribute to the observation of sanitary norms by the athletes. The project is co-financed by: USAID/Winrock within EC-LEDS grant program and Kutaisi City Hall. The project envisages the introduction of such energy efficient measures as installation of heating system working on the solid fuel – agricultural residues which are common for this region – hazelnut shell, and replacement of incandescent light bulbs with CFLs in the rooms. As a result of the implementation of the proposed energy efficient measures in addition to the annual energy savings, the emissions of CO2 into atmosphere will also decrease. Provision of employees of various, municipal or community buildings with the information and increase their awareness on how energy resources are used in the workplace and how their actions can directly affect energy consumption. 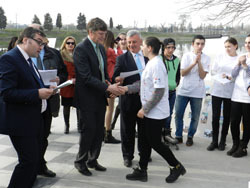 Contribution to the capacity building of Georgian municipalities and self-governments in the development of the Energy Efficiency policies and local action plans. Creating easily accessible informational resources demonstrating various phases of implementation and operation of demonstration projects. Supported public Broadcaster Radio-1 in preparation and broadcasting of a series of monthly radio programs on energy efficiency in radio programs “Weekend on Radio 1” and “Ecometri”. Thematic contest for best projects among schoolchildren from the Georgian CoM signatory cities encourage them to suggest such RE & EE projects which will contribute to the mitigation of CO2 emissions in their cities. Contest for thematic posters among the students of art schools & Academy of Arts. At the request of several schools conducted trainings in types and sources of energy, climate change and renewable energy for the 4-5 grade students. Developed web application Carbon footprint calculator- The calculator is user-friendly and based on data provided by the user produces the annual amount of emissions generated by the family/person. It also provides with simple tips on various actions targeted on decrease of emissions. Developed and printed for dissemination informational leaflet on LED lighting systems. The leaflet contains practical information for selection of most efficient lighting systems, providing information for various light bulbs, such as regular incandescent, CFLs and LED. Developed and printed annual Calendar 2014 for dissemination among various governmental, non-governmental organizations working in energy field as well as among partner organizations and beneficiary organizations. 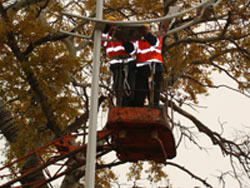 For illustration of calendar, the site photos of implemented clean energy demonstration projects in Tbilisi and various regions of Georgia were used. Each page of the calendar contains briefs of implemented demo projects. Supported local TV companies in development of short video films covering the implementation of demo projects in Rustavi, Telavi & Gori. Organization of events of Sustainable Energy Week 2014-2015 including: schoolchildren’s conferences in 6 CoM cities, Exhibitions of Renewable Energy and Energy Efficient Technologies; Exhibition of thematic posters “Utilization of Renewable Energy & Energy Efficient Technologies” developed by schoolchildren and students of the art schools; Exhibition of student architects’ works and award ceremony of the winners in competition for the best project; etc.